Part of me still cannot believe that Calvin Johnson is retired and that he will not be on the field for the Lions this season. I cannot even remember what it was like watching the Lions without him there. Mostly because they were so bad that I purged most of that part of my life from memory, but that’s not the point! It is going to be very tough to watch the Lions without one of my favorite football players ever and I’m going to miss him dearly. So let’s pause for a moment of silence in honor of the best receiver of our lifetime. This season could be a rough one for the Lions. I’ve gone over the schedule and the roster many times and I still cannot quite decide how the season will play out. I will say this, if the Lions lose to the Colts in week one, they will probably go 5-11 or 6-10. I want to be on the optimistic side of things for a change of pace, so that’s what I’m going to do. I did not have a lot of time to put this together, so what you see is what you get. Real life tends to get in the way of blogging. Here’s a look at the unofficial depth chart on offense. There are quite a few weapons on the offensive side of the ball but the keys are in the interior offensive line. I have faith that if Matthew Stafford is given time, that he’ll help Marvin Jones, Golden Tate, Anquan Boldin, Theo Riddick and Ameer Abdullah make plays. But it’s tough to run the offense from your back. Not only that, if the offensive line (specifically the guards) do not improve, then the horrendous run game will not improve. It’s not easy to win with a one-dimensional offense, no matter how talented it is. This is going to be a big year for Stafford and I think a lot of people are going to be surprised with how well he does this year without Calvin Johnson. I tend to be more of a Stafford fan than most, but he excelled in Jim Bob Cooter’s offense last season and I expect more of the same. No more Calvin means no more safety net, so it’s time for Stafford to grow up and quickly. Back up quarterback does not need to be addressed because if Stafford goes down the season is over. No, I do not care that Dan Orlovsky made the team over Jake Rudock. You should not either. If you think Rudock is the second-coming of Brady or is better than Stafford/should be the Lions future quarterback, please do me a favor and never talk to me again. I’m not joking. At running back, Theo Riddick and Ameer Abdullah will be driving the bus. Abdullah desperately needs to stay healthy this year because without him, I think the team would rush for 300-350 yards all season. No joke. Riddick will take quite a few snaps away from him in the passing game (aka all of them), but Abdullah is going to shoulder the load with the carries. Out of all of the running backs on the team last year, Abdullah is the only one that averaged more than 4 yards per carry and he was at 4.2. That is going to absolutely have to change. I don’t expect Zach Zenner to have much of a role other than being a short-yardage change of pace back and Dwayne Washington has carved himself out a niche role as a kick returner. To deal with the major loss of Calvin Johnson, the Lions did the prudent thing and signed Marvin Jones and Anquan Boldin. Neither of them have Johnson’s talent or game-changing capability, but I LOVE their fit in the Lions offense. I think both of them with Golden Tate will create a three-headed monster that will be difficult to cover. Marvin Jones looked very good in the preseason and Anquan looked like he still has plenty left in the tank. Those three can play any position at wide receiver, but I expect Anquan to start off in the slot. Tate will definitely get reps inside though, he’s too much of a match up nightmare not to. Now with the injuries to tight end, the Lions are only carrying four wide receivers, which is not a problem. Andre Roberts rounds out the group and they have two players on the practice squad. I had hoped Jay Lee would make the team, but apparently the Lions did not like him as much as I did. Never did I ever think I would miss Brandon Pettigrew but holy hell do the Lions need a tight end that can block again. 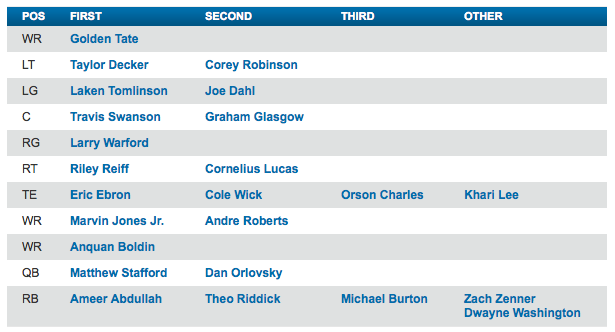 Orson Charles and Khari Lee and Cole Wick are okay, but this team needs Pettigrew back badly. And if Eric Ebron gets hurt again the tight end position becomes a total wasteland. Ebron is a player that is going to have to take a major step forward to help pick up for the production that is lost with Megatron’s retirement. Ebron has all of the physical tools to be successful…things just need to start clicking for him to take that next big step (47 receptions for 537 yards and 5 TD’s was a solid year last year though). The offensive line is the biggest question mark for the Lions offense. They’ve taken strides to improve the group as much as possible, but there is still work left to be done. Taylor Decker has become a plug and play rookie at left tackle and allowed Reiff to shift to the right side. I do not think Reiff was that bad at left tackle, but he is definitely better suited for the right side. The real question marks are the entire interior offensive line. Larry Warford has really taken a step backwards since his rookie season. Laken Tomlinson went through growing pains at left guard during his rookie season and this year will be important to see how his development is progressing. Meanwhile, Travis Swanson was a big weakness at center last year before the offensive coordinator switch and one can only hope that he improves. If not, the interior line could be a disaster. The Lions did draft Graham Glasgow, who could take over the starting center job at some point this season, and Joe Dahl, who can play any position on the line except for center. Both of the rookies could become contributors if necessary and I am personally a big Dahl fan. If this position group falters though and cannot get anything going in the run game, losing Calvin Johnson will be the least of the offenses (and Matt Stafford’s) problems. The defense is a group where I really like the starters and do not care for any of the depth behind. If you even want to call it depth. The defensive line group is going to be stout with Ezekiel Ansah and Devin Taylor at defensive end and Tyrunn Walker and Haloti Ngata at the tackle spots. Ansah is going to be critical for this group’s success and his development has truly been incredible. 14.5 sacks last year was absolutely big time and far greater than I thought he would ever do when he Lions picked him. Taylor will need to take a step forward with his production considering his increase in playing time, though his 7 sacks last year are nothing to turn your nose up at. 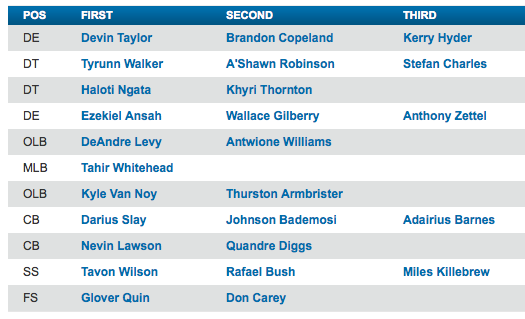 And needless to say, Walker and Ngata are going to need to stay healthy. The depth behind Walker and Ngata is almost non-existent and A’Shawn Robinson was just okay in the preseason. I would expect Wallace Gilberry (DE) and Khyri Thornton (DT) to see plenty of playing time and it will be imperative for them to play well when they get their shot. Ngata and Walker cannot stay on the field the entire game. The linebacker group got a much-needed boost with DeAndre Levy finally getting healthy and like the rest of the starters on defense, he must stay healthy for this unit to have a chance. Levy, Ansah and Slay are arguably the three most important pieces on defense and it was quite clear how much they missed Levy down the stretch last year. Tahir Whitehead should thrive in his starting spot at middle linebacker and Kyle Van Noy is a bit of an enigma. He was a playmaker in college but has yet to make an impact in the NFL. Past these three starters though there are some major issues. The secondary will be lead by Darius Slay and Glover Quin. Slay has developed into a Top 10 cornerback in the NFL and Quin has steadily become a rock solid free safety. Nevin Lawson is currently the starter at the other corner spot, but I’m not so sure he holds onto that for very long with Quandre Diggs progression. At any rate, Diggs will see plenty of playing time when the Lions go into a nickel set. Strong safety is the biggest question mark in the secondary and I’m not sold on Tavon Wilson as the starter. Rafael Bush is his backup and I’ll be curious to see if Bush makes a push for Wilson’s spot during the season. As per usual, Don Carey is the backup at free safety and I pray he does not have to play too often. This is definitely the biggest problem spot on the defense, even with Slay and Quin. Jim Caldwell said Tavon Wilson is the Lions' starting SS, but Rafael Bush & Miles Killebrew also will see time. Miles Killebrew is a rookie that I thought would be inactive for a bit, but he’s a guy I liked and apparently the coaching staff feels the same way. Having packages where he will play likely means he’ll be near the line of scrimmage since his biggest asset is his tackling ability. No need to say much here, Matt Prater and Sam Martin are rock solid starters (despite Sam Martin being a mental midget when it comes to twitter). So right now I’m thinking optimistically that this team can go 9-7, but finishing the last three weeks 0-3 would be absolutely devastating, especially because that means they would be right on the playoff bubble. I think they’re primed for a wild card spot this season, but it would not shock me if 9-7 wasn’t quite good enough to make it. A hot start is going to be critical because as we all saw last year, you can play yourself out of the playoff race quite quickly; no matter how well you finish. This year, I think it’ll be a bit of the opposite, a hot start and a tough schedule down the stretch that could do them in. This team needs another Bob Quinn draft to get more pieces into the mix before they can compete for the Playoffs regularly. One thing that I loved about Bob Quinn is that he was not afraid to cut ties with free agent signings that he did not like or did not have a use for. Stevan Ridley was not long for this team and it’s good to see that Quinn did not want to hang onto him merely because he signed him a few months prior. Oh and yes, 9-7 would mean that Jim Caldwell keeps his job. This entry was posted in NFL and tagged A'Shawn Robinson, Ameer Abdullah, Bob Quinn, Brandon Pettigrew, Calvin Johnson, Cole Wick, Darius Slay, DeAndre Levy, Detroit Lions, Devin Taylor, Don Carey, Dwayne Washington, Eric Ebron, Glover Quin, Graham Glasgow, Haloti Ngata, Jay Lee, Jim Bob Cooter, Jim Caldwell, Joe Dahl, Khari Lee, Khyri Thornton, Kyle Van Noy, Laken Tomlinson, Larry Warford, Matthew Stafford, Nevin Lawson, Orson Charles, Quandre Diggs, Rafael Bush, Riley Reiff, Season Preview, Tahir Whitehead, Tavon Wilson, Taylor Decker, Teryl Austin, Theo Riddick, Travis Swanson, Tyrunn Walker, Walalce Gilberry, Zach Zenner, Ziggy Ansah. Bookmark the permalink.